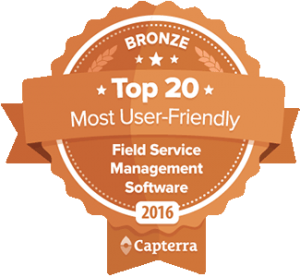 FSM solutions are used to remotely locate, track, and manage information regarding the teams of technicians sent by companies into the field for service processes. There are numerous benefits offered to organizations who deploy these solutions such as cost savings, improved employee productivity, and enhanced customer satisfaction. Highly distributed business operations such as refineries, pulp and paper manufacturing, mining, and transportation industries are major adopters of FSM solutions as field work is a fundamental part of their business model. Their assets and equipment are situated in diverse locations and require frequent and efficient installation, monitoring, inspections, testing, and repairs. Thus, the increased demand for optimized workflow and enhanced productivity is encouraging the adoption of FSM among enterprises. Quantzig, a data analytics company’s latest case study shows that FSM solutions can reduce overtime costs by up to 25%, resulting in huge cost savings. 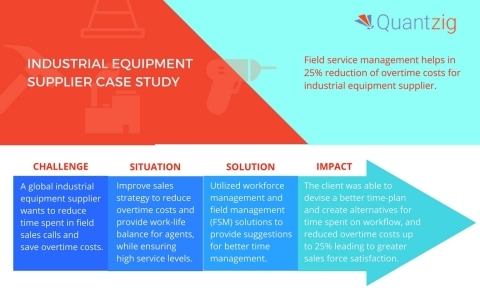 A global machinery and equipment manufacturer and supplier to construction industries wanted to reduce time spent by its workforce in field sales calls, looking to save on overtime costs. Analytics experts from Quantzig were able automate and optimize the information to analyze time spent in traveling, breaks, non-fruitful field calls and other activities. The client was able to take the suggestions and data to ultimately reduce overtime costs by 25%.